By the time of the concert on 8 October, there will have been 12 rehearsals – 10 on Wednesday evenings ( including those in June) and the Workshop on 10 September which counts as 2 rehearsals. To sing in the concert we should attend at least 8 rehearsals. On the day of the concert, the afternoon rehearsal will take place from 2.00-3.00/3.30. Our Music Director Simon Lindley is having an enjoyable and busy summer. After a holiday period through July interspersed with recitals in his home village at Fulneck and at Doncaster Minster, there was Annie at Leeds Minster’s Parochial School, St Peter’s CofE Primary, and a notably adventurous concert of Music with the Mystic Poets at the magnificent church of St Michael and All Angels, Headingley. Other July activity included taking a rehearsal for the famous Colne Valley Male Voice Choir and organising a lecture at this year’s Southern Cathedrals Festival for the Church Music Society, of which Simon has been Secretary for 25 years. August was fully back to work with the special Yorkshire Day service at Halifax Minster on Monday 1 August, four recitals on Tuesday evenings in and around Doncaster as part of Doncaster Choral Society’s fundraising and outreach as well as the start of the Overgate Choir’s jubilee season preparing for Creation. Each Sunday in August there is an Organ Concert at Leeds Minster and Dr Lindley plays three out of this year’s four recitals at 6.30 each Sunday evening in the month. He also has a concert engagement on Saturday 27 August at Bainton Church near Driffield in the East Riding on the fine and newly-restored Victorian instrument there. Rare church music by Handel is being presented at Fulneck Church at 4.00 on August Bank Holiday Monday with St Peter’s Singers and Principals of the National Festival Orchestra. Principal soloists are Claire Strafford, Helen Strange, Lucy Appleyard, Peter Condry and Quentin Brown with Alan Horsey as the organist. At Leeds Minster’s Flora Leodis flower festival Keith Swallow is at the piano for a lunchtime concert on Friday 2 September and Simon at the organ at 3.00 and 7.00 the same day. On Saturday 3 September there is Choral Festal Evensong at Leeds Minster at 4.00 marking 175 years since the consecration of the present building in 1841. All are welcome. This will be Dr Lindley’s last service as Minster Organist, though as Organist Emeritus he will undoubtedly continue a degree of practical support of the Minster’s musical activity in the years ahead. 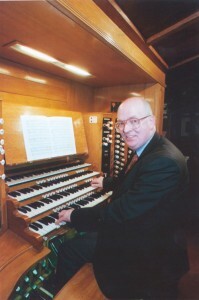 A special organ recital of music by Handel will find Simon at Holy Trinity Boar Lane Leeds (at the Southernmost end of the Trinity Quarter and very near Leeds City Station) – that’s on Thursday 8 September at 1.00 and the following evening, Friday 9 September, Simon is at the console at St Mary the Virgin Elland for a special organ concert at 7.30 pm. The programme marks some special 1916 anniversaries including the death of composer George Butterworth in the Battle of the Somme a century ago this summer and the birth of Simon’s teacher, organist, choirmaster, composer and soldier, Dr Bernard Rose OBE [1916-1996] Organist and Informator Choristarum at Magdalen College Oxford 1957-1981. Leeds Town Hall Monday lunchtime concerts begin again on 19 September at 1.05! With effect from 4 September, Dr Lindley will be doing some playing on an occasional basis at Halifax Minster to ‘keep his hand in’ and he will direct a Come Sing Fauré Requiem on Remembrance Sunday 13 November at 2.30 in Halifax Minster with the performance at 4.00. Any Overgate Choir Members will be most warmly welcome to participate. at All Saints’ Elland on Saturday 8 October at 7.00 accompanied by the National Festival Orchestra with soloists Ella Taylor, Paul Dutton and Thom Meredith marking the 25th anniversary of the first performance by Overgate Hospice Choir at Halifax Minster in 1991. A number of members of the Choir have sustained continuous membership over the years and some have sung at every concert and event since that first pioneering effort – a nationwide endeavour set off on Radio 2 by the late Earl of Harewood. It is certain that the Overgate group was among the very first choirs in Britain to be formed specifically and solely for the benefit of its community’s local hospice and this continues to be the aim today. The group operates on a full-time basis for over ten months each year. Weekly rehearsals are held at St Jude’s Church Hall in Savile Park by getting on for 100 singers. There are four main concerts each season. Tickets for the October concert are now available from Choir members, at all the usual outlets including Harvey’s, Shoesmith’s, the Hospice at Hullen Edge and also on line from the Choir’s Website – www.overgatehospicechoir.co.uk – through “We Got Tickets”. The work presents the absorbing story of the Creation in astonishing terms, with vivid representations of the original state of chaos at the outset and of the creation of the animals as the music proceeds. Haydn was at the height of his considerable creative powers when he completed the piece in 1798 and the superb choruses are interspersed with arias for the soloists on their own and together in ensemble. 2016 will be the fourth occasion on which the Choir has presented Creation. Conductor Dr Simon Lindley has served as Music Director of Overgate Hospice Choir since 1997 with Choir accompanist/organist Alan Horsey and Chorus Master Gordon Normanton making up the musical “team”. Around 150 vocalists and instrumentalists are involved. A wonderful evening is guaranteed! Gratitude goes particularly to Father David Burrows, Rector of Elland and colleagues at All Saints’ for allowing us to use this magnificent church. You don’t have to be a music-lover to enjoy Creation – the experience is one of the most magical in the whole of Western culture! Come prepared to smile and be thrilled by this magnificent music. Thanks to very generous sponsorship by Grand Central Railway and Sellers International Ltd. of Huddersfield all ticket and programme sales go to the work of Overgate – the Choir has raised £277,626 for Hospice funds over the past quarter of a century. The Choir photograph will be taken next week, Wednesday 17 August in ST JUDE’S PARISH HALL. Please be there at 6.30. We shall be wearing concert dress and using our folders.